The Court of Honour at Stampex International is celebrating female philatelists with two collections, one from Birthe King and the other from Judith Holder. In this exclusive preview, Birthe King previews her exhibit. 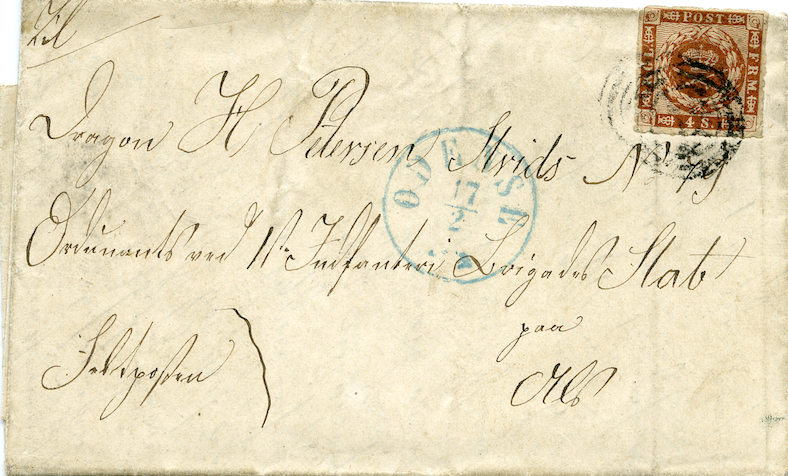 This correspondence consists of twenty letters between a newly married couple and their separation during the 1864-War between Denmark and Prussia, and it probably sparked my interest in postal history, writes Birthe King. From a philatelic point of view, there is not much of interest, most stamps have been torn off, but the content of the letters between Hans and Ane Katrine Petersen tells a fascinating story. They had settled in the town of Odense on the island of Funen, where Hans had a shop selling flour, other kinds of food, and assorted household items. On the death of the Danish King Frederik VII on 13 November 1863, his successor, King Christian VIII, had little experience in dealing with state and political issues as he had not been brought up to become a king. Internal politics came to the forefront with legislation to change the relationship between Denmark and the Duchies of Schleswig-Holstein, which the inexperienced king was persuaded to sign. At the same time the Prussian Chancellor, Otto von Bismarck, seized the opportunity to initiate his plans for a united Germany, starting a war to achieve independence for Schleswig-Holstein from the Danish Kingdom. So, in January 1864 Hans Petersen was called up for military service as an army groom in the stables. This probably saved his life, as he did not see fighting at the devastating battle on 18 April at Dybbøl, which the Danes lost. However, he was never once granted leave to visit his wife, who was running the shop back home in Odense, where she had the better of the miller, who she wrote was trying to cheat her because she was a woman. This display shows the letters exchanged between Hans and Ane Katrine whose pregnancy, although never mentioned, becomes gradually evident in their correspondence. Contemporary illustrations from The London Illustrated News and Illustreret Tidende put their story into perspective. Birthe King is a member of the Stamp Collector magazine Advisory Board. Find out much more about Spring Stampex 2019 with the official catalogue, included with the March 2019 issue of Stamp Collector. Why not subscribe, save and have every issue delivered direct to your door?